Contains Resveratrol = To 6 Glasses of Red Wine!! New Chapter's patented Zyflamend® formulation represents a scientific breakthrough in promoting a healthy inflammation response. Recent research studies suggest this may be an effective strategy to promote healthy joint function and normal cell growth. New Chapter® has extensively researched the herbal pharmacopoeia and international medical databases and has discovered that the following time-tested herbs, properly extracted and blended in the correct proportions, contain at least 8 phytonutrients that may safely and significantly promote a healthy inflammation response. HOLY BASIL (Ocimum sanctum) Contains ursolic acid, which significantly enhances detoxification and promotes a healthy inflammation response. TURMERIC Unique curcumin phytonutrient complex, synergistic with green tea, significantly multiplying each herb's ability to promote healthy eicosanoid balance. GREEN TEA Proceedings of the National Academy of Sciences report green tea polyphenols exert a beneficial effect on healthy eicosanoid balance. Major university database notes green tea contains 51 phytonutrients that promote a healthy inflammation response. ROSEMARY Dual extracts offer highly concentrated, full spectrum eicosanoid balance and support detoxification. HU ZHANG (Polygonum cuspidatum) Richest known resveratrol source, with each daily serving delivering the approximate equivelant of six glasses of resveratrol-rich wine. CHINESE GOLDTHREAD AND BARBERRY Unique berberine phytonutrient complex naturally promotes a healthy inflammation response. OREGANO Source of large number of phytonutrient modulators (31) according to USDA database. BAIKAL SKULLCAP Unique baicalin phytonutrient complex, naturally promotes healthy inflammation response. "Supercritical" means Super Purity, Super Potency, Broad Spectrum, and No Chemical Solvents. We take nature's finest herbs and then extract and hightly concentrate (as high as 250 to 1) their precious, full spectrum ingredients. We do not isolate single ingredients or spike our extracts with synthesized additives. We deliver the wisdom of nature, with the complexity and organic nuances of the natural herb preserved for you. In fact, the supercritical process is the gentlest way to extract these delicate plant compounds in a manner to optimally preserve their potency and stability. And when you take New Chapter's supercritical extracts, neither you, nor the environment, have to contend with chemical solvents. A unique blend of herbal supplements named “Zyflamend” by New Chapter that have been confirmed and researched to work jointly for wonderful, anti-inflammatory purposes. It is an effective and natural treatment option to aid controls the body’s inflammatory pathways. Zyflamend is one of the best selling herbal supplements sold in the globe. Several studies have been verified that Zyflamend plays a valuable role in inflammation, cardiovascular and joint health. Zyflamend ingredients have been studied for their optimistic effect on health and it particularly works as a ‘COX’ inhibitor, which causes it to effectively reduce and regulate inflammation. 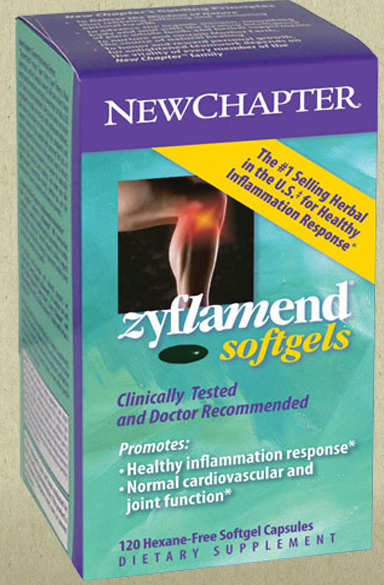 Zyflamend can be very valuable in assisting to control ache and inflammation related with arthritis. In sports injuries, Zyflamend also encourages recovery and reduced inflammation as it is also known as a natural alternative to traditional medicine for injuries and illnesses related to inflammation. Zyflamend can also be treated as a booming tool in fighting the signs and causes of aging, due to its powerful antioxidant collection. As clinical study, Zyflamend has been shown to be really effectual in decreasing cancerous cells and aiding to fight prostate cancer in one valuable. It is particularly well-known for its successful use in averting and fighting prostate cancer. It is vastly suggested for those patients who have been diagnosed with prostatic intraepithelial neoplasia, mostly those who are high risk for developing prostate cancer. Some studies confirmed that it decrease block androgen receptors, prostate cancer tumors, and induce apoptosis of cancer cells. I am glad to know that it’s not a drug it’s an herbal supplement when I first time studied Zyflamend detail. I have problems with knees pain and an inflammation problem and in starting I would think that it would not work and recover my problem. I was glad to tell that this product could aid with both issues and after one week notice its result. I started using it about two and a half months ago and I wanted to say that after some months use of this supplement help with the little bit of pain in my knees. It took about two week for me to start seeing some chief recoveries and impressed me. Now I continue use it because I have long run up in a whole day and want to complete recover my pain. For joint support & healthy inflammation response, herbal supplements consider as last lasting and safe. Supplements have become now the essential part of most Americans daily life style.